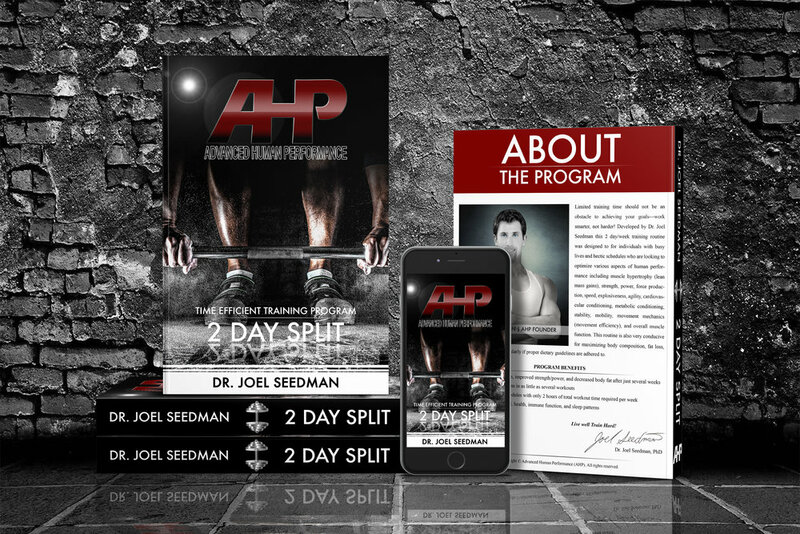 AHP presents Weekend Warrior - an exclusive bundle package from Dr. Seedman that contains two of his most popular products for those strapped for time but still want that adonis body. These products, when grouped together, present a time saving, transformative platform for gaining unprecedented levels of speed and power, movement mechanics, neuromuscular stabilization, and total body performance. Specifically, this Gold Tier bundle package contains (1) Bodyweight Program and (2) 2 Day Split. Implementing these products together is quite simple. During the week, the athlete performs primarily the bodyweight workouts that can be performed in their home, office, or apartment (as they require no equipment and only 20-30 minutes). Once the weekend approaches the athlete will crush 2 intense yet highly effective strength training workouts from the 2 Day Split in their nearest gym or training center. Even if your crunched for time, this combination is guaranteed to give you continual progress and strength and size gains. See below for an overview of this bundle package and links to detailed descriptions of each included product. Life happens, right? During times of work and travel, vacations, crowded living conditions, or long work hours, accessing a fully-equipped gym can be, well, near impossible. Dr. Seedman designed this program to be used with absolutely no equipment. What's best is that everything in this bodyweight program can be performed anywhere at anytime - yes, even in that small hotel room. In addition, this program includes an effective cardio and conditioning plan. In addition, with your purchase of Weekend Warrior, you receive 3 FREE awesome training routines by Dr. Seedman to ensure your entire body is completely transformed. Specifically, you'll receive the following: (1) Upper Body Blast, (2) Lower Body Blowout, and (3) Core Blitz. Each of these was specifically designed by Dr. Seedman to maximize strength, hypertrophy, and neuromuscular activation across the entire body. Upper Body Blast (Free Product #1) is an intense upper body template designed for targeting hypertrophy and strength in your chest, back, shoulders, and arms. The Lower Body Blowout (Free Product #2) is an elite lower body template designed for targeting hypertrophy and strength in quadriceps, glutes, hamstrings, calves, feet, and ankles. Finally, Core Blitz (Free Product #3) is the ultimate abdominal template designed for building core strength and definition.